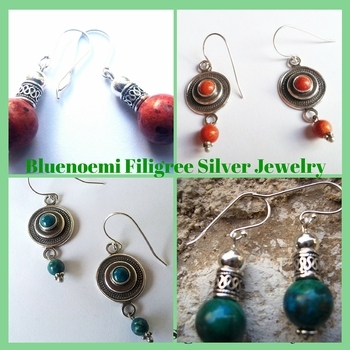 Israeli ethnic filigree earrings. Sterling silver in a traditional yemenite design. Israeli beautiful yemenite design , featuring traditional designs and techniques in modern jewels. Set with Eilat stones, turquoises, garnets, opals. Filigree Ethnic jewelry from Israel.